Annabel Beam is one of three sisters raised in the Texas countryside by loving parents. But what should have been a happy, carefree childhood was blighted when Annabel developed a painful and seemingly incurable digestive disorder. Her parents spared no expense in the search for a cure, but medical experts assured them there was none. On a rare day when Annabel felt well enough to play outside, she was climbing an old hollowed-out tree when a branch snapped and she fell, head first, thirty feet down inside the tree. Miraculously, she survived the fall but was knocked unconscious. Rescued and later released from hospital, Annabel told her mother, 'you know I went to heaven when I was in that tree'. Annabel shared with her mother her amazing experience of talking to God, who told her that it wasn't her time and that she must go back. What happened next was the greatest miracle of all. Annabel was inexplicably cured of her illness and her doctors could offer no explanation. 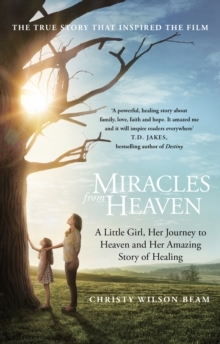 Written by Annabel's mother Christy, Miracles from Heaven is the story of a little girl's - and a family's - inspiring journey. 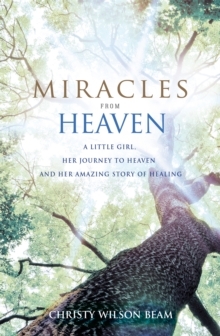 Deeply moving and heartwarming, the book recounts the fateful day of the accident, Annabel's description of her time in heaven and her miraculous recovery. This is the story of how one family never gave up hope.